Why has Jeremy Hunt turned the NHS into a profit-creation scheme for private companies? 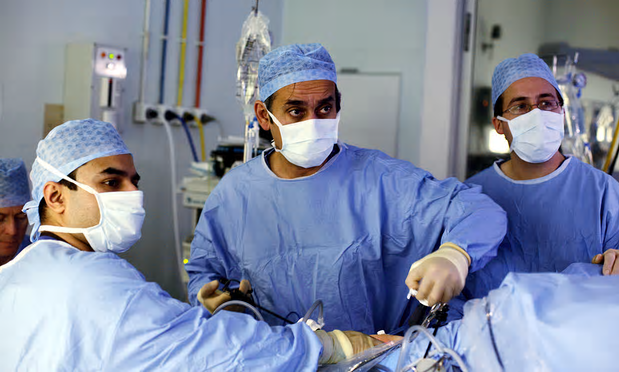 Lord Darzi, centre, performing surgery. He has given his support to a smartphone app run with DeepMind to alert staff to patients at risk of kidney failure [Image: Martin Godwin for the Guardian]. This Blog has run stories on the sharing of patients’ medical data without their knowledge before, and it seems likely this is more of the same. The claim then was that the information would be used for medical research and screening for common diseases – as is the claim now. Also, that patients could opt out of their data being used. How many of them know that? The spokesman for the Royal Free said the arrangement with DeepMind is the standard NHS information-sharing agreement set out by NHS England’s corporate information governance department, the same as the other 1,500 agreements with third-party organisations that process NHS patient data, and that’s all very well. How long has this “standard” agreement been running? Since 2014? If so, then the Department of Health has ignored the wishes of patients across the UK who did not want the government to sell any patient information to private companies. We simply don’t know what they will do with it. Are patients starting to receive calls from insurance companies, for example? The article quotes Sam Smith, of the health data privacy group MedConfidential, who told the New Scientist: “This is not just about kidney function. They’re getting the full data. Exactly. The Department of Health has serious questions to answer. The National Health Service is not a profit-creating system for private companies. A company owned by Google has been given access to the healthcare data of up to 1.6 million patients from three hospitals run by a major London NHS trust. DeepMind, the tech giant’s London-based company most famous for its innovative use of artificial intelligence, is being provided with the patient information as part of an agreement with the Royal Free NHS trust, which runs the Barnet, Chase Farm and Royal Free hospitals. It includes information about people who are HIV-positive as well as details of drug overdoses, abortions and patient data from the past five years, according to a report by the New Scientist. DeepMind announced in February that it was developing a software in partnership with NHS hospitals to alert staff to patients at risk of deterioration and death through kidney failure. The technology, which is run through a smartphone app, has the support of Lord Darzi, a surgeon and former health minister who is director of the Institute of Global Health Innovation at Imperial College London. However, the agreement on patient record sharing has caused concern among those who have already been concerned about Google’s moves in the healthcare sector. A spokesperson for the Royal Free said patients would not be aware that data was being made available but it was encrypted and such an arrangement was standard practice. Because he wants better health care for consumers. By “consumers”, do you mean people who pay for it? Because Tories hate anything from which they cannot enrich themselves and their cronies at public expense. It is as simple as that isn’t it? Hunt is engaged in trying to fit saddles to all junior doctors to enable others to ride on their backs. I mean patients. Who would surely be the ones who should pay for it. Sadly that’s not strictly. The money is taken from them, and _someone else_ makes the spending decisions, which both reduces patient choice and competition, keeping quality low. Oh really? Considering the heights which public approval of the NHS had reached under Labour, and the depths to which it has fallen under the Conservatives, I consider your opinion to be worthless. Whats standard practice, ‘encryption’ ? This sounds like a soundbite from DC. The tories only want their own kind and the rich to have healthcare, the plebs can go without and die! Great seeing on the news the tories have blinked first on this subject! The answer to the question is: Because that is how they receive additional funding in order to over-spend at electoral campaigns like they did in 2014 and 2015. The profiteers obviously understand that the Tories must be on a bung of some kind. It is not just football where dodgy practices take place. Also, the Tories are happy to undermine public confidence in the NHS. That makes it all the easier to privatize it. Just ask that nice Mr Hunt – he has even written books about it.